This site is located off the cliff at the northern end of the beach that stretches from Terrigal north. Originally this site was found by using two telegraph poles that were used to locate the site. One of these is no longer visible as someone built a house in front of it. I do not have any marks or GPS co-ordinates to find it. The site is not that far from shore, perhaps 650 metres. 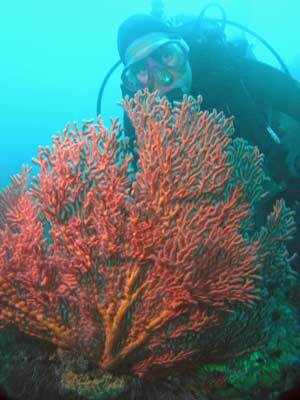 The reef comes up to about 12 metres in one spot. 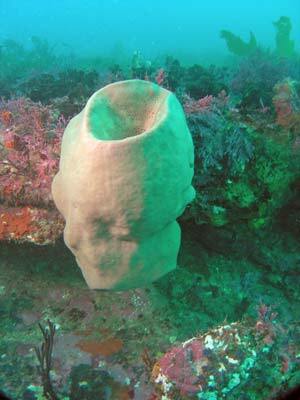 The main site consists of a sand gutter that runs from the south-east to the north-west into the reef. The sand gutter is not very wide, perhaps 10 metres at the most. The depth of the gutter is about 19 metres. You normally anchor at the north-western end of the sand. From here, head down along the southern side of the gutter. The reef juts up a metre or so in a series of small boulders and walls. There are a lot of sea squirts and some sponges along here. After this, turn around and head back towards the anchor. Once back at the anchor, follow the reef edge to the south-east again, but this time on the northern side of the gutter. Along the edge there are some nice small gorgonias and you may even see a sea dragon like I did. After about 40 metres the northern side of the reef almost meets up with the southern side. Head back towards the anchor, this time staying a bit shallower away from the reef edge. Soon you will see some larger boulders and the reef top. These form some cracks and overhangs. 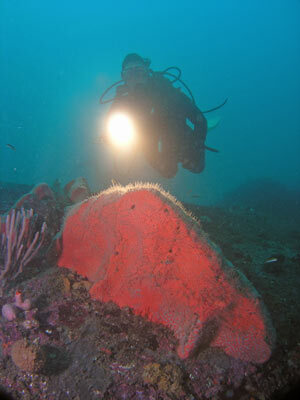 In this area you should see large cuttlefish and at least one resident wobbegong that is said to be here all the time. There are also normally large schools of ladder-finned pomfrets, one-spot pullers and yellowtail. 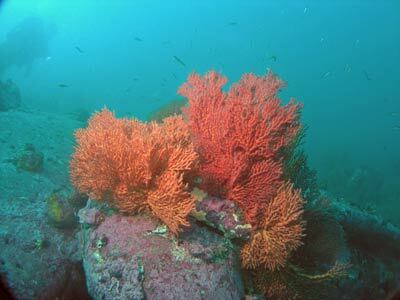 As well as the fishlife, the most interesting feature of this area is the fantastic number of gorgonias. There are dozens of them, of all colours. They are not very large, the biggest about the side of a tabloid newspaper, but there are so many. They make a great photograph (see some of mine on this page). Once back near the anchor, you can continue to the north-west. The gutter sort of disappears but a bit further on it comes back, although there is no sand in it. This is also an interesting place to explore. By now you will probably be low on bottom time (especially as this is often a second dive) so head back to the anchor and ascend. 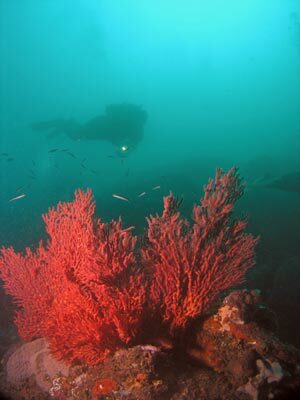 This is a reasonable dive site, not one of the greatest I have done but interesting nonetheless. 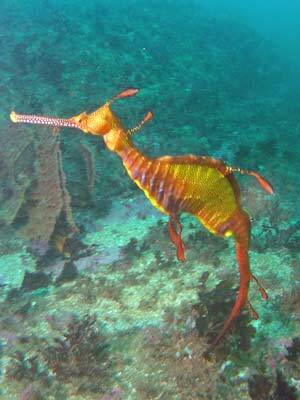 You can dive it with Terrigal Dive Centre or Pro Dive Central Coast, both of whom I am happy to recommend.